Please Don’t Poison The Wedding Guests! Hydrangea flowers are popular for weddings and many brides choose to carry that theme onto the cake they will show off (and cut into) at the reception. Hydrangea flowers can be made out of frosting or sugar in the form of gum paste and fondant. I am not a cake decorator, but it looks like hydrangea flowers take a lot of time and patience to create in this way, and I’ve seen some frosting ideas that look truly horrible. You may be tempted to just add real hydrangeas to your cake, but wait, before adding real flowers to anything, do your research. Although many flowers are edible, the hydrangea flower is not one of them. In fact, they have poisonous parts and therefore I would want to keep them in my bouquets only. 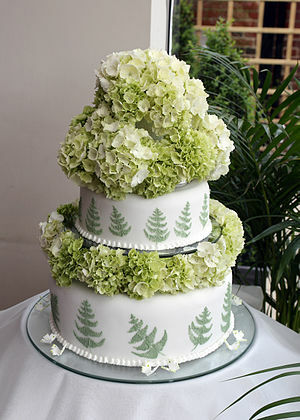 The cake pictured here seems to have real green and white flowers tucked in between the raised layers and then piled up on top. I would not think that this is a good idea since parts of the hydrangea are poisonous, and I wouldn’t want them on a cake that would be fed to hundreds of people. Not a good wedding memory. If those flowers are not real, they sure fooled me! A tiered cake could have a large blossom on top, such as the Periwinkle Hydrangea Blossom Ball Wedding Cake by the Pink Cake Box. Or have an all white cake with a scattering of blue petals- made of sugar -around the bottom. It all depends on your preference, time, connections, and bank account. Some modern brides will incorporate cupcakes into the reception which make for easier grabbing by the guests and no need for cutting and serving. Gumpaste flowers can be used to create blue petals, such as the chocolate cupcakes featured on Confections, Cakes & Creations website. Or buy some hydrangea petal shaped cutters and make your own realistic looking sugar paste hydrangea toppings. Better yet, buy them for someone else to use and pay them for their efforts. After all, as the bride, you will be too busy for such things.